Ken holds a BFA in painting and drawing and an MFA in jewelry and metalsmithing. 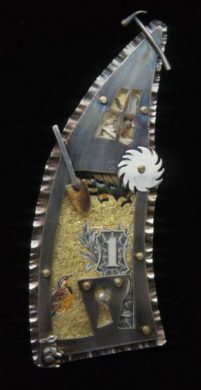 Both areas of this training are important to his work and he combines the two in one-of-a-kind mixed media wearable assemblages that are made of colored, painted, patterned, and textured bits of unusual materials combined with silver and gold. 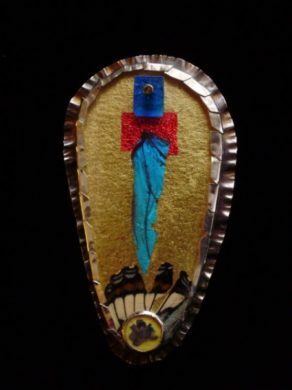 His jewelry has been exhibited nationally and internationally and is found in private and public collections including the permanent collections of the Smithsonian National Art Museum and the Tacoma Art Museum. As an educator Ken has been teaching for more than 25 years. He has presented workshops on jewelry and metalsmithing in schools around the country including Penland, Haystack, and Arrowmont. 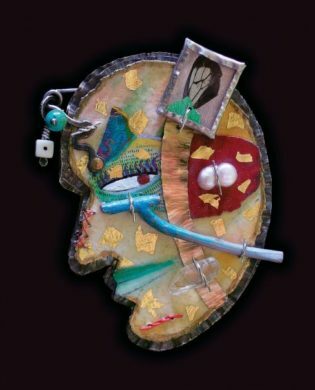 After nearly 20 years teaching at Montana State University Ken resigned his position in the spring of 2007 to pursue and teach full time studio work and workshops. He now lives and works in the historic smelter town of Anaconda Montana in a newly remodeled home he shares with his wife, dog, and five cats.